Pre-inked, re-inking fluid compatible with Clik™ and Universal™ stamps. Made in the U.S.A. and TAA compliant. 7 ml. plastic bottle. 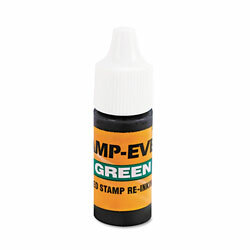 Capacity (Volume) : N\A; Ink Color(s): Green; Refill(s) For: Clik!™ Stamps; Universal™ Stamps; Ink Types: N\A. Stamp Pads and Ink Refills from U.S. Stamp & Sign! 231 In Stock today.